Visit: We Live in an Ocean of Air at Saatchi Gallery. 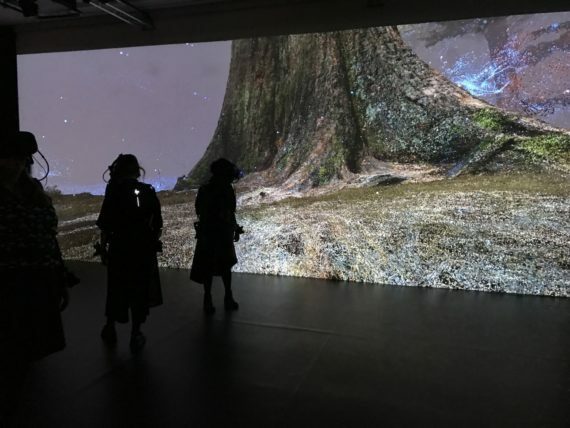 We live in an Ocean of Air is a virtual reality experience where the invisible connection between plant and human is revealed through breath. In a 20 minute experience cutting-edge technology illuminates the invisible- but fundamental- connections between human and natural worlds. You’ll be transported to an ancient forest and witness the majestic power of the largest organism to ever exist – the giant Sequoia tree. Visitors are invited to step through the canvas to explore a magical world where the invisible exchange of oxygen and carbon dioxide is beautifully brought to life. Untethered virtual reality, breath and heart sensors will track your real-time breathing and encourage you to reflect on our dependence and responsibility to the organisms we share our planet with. We live in an Ocean of Air can be experienced both individually and collectively; experience prioritised over passive contemplation. The wider gallery allows multiple tiers of immersion, with large projection screens welcoming audiences into the heart of the environment, before expanding to reveal the scale of the digital forest that lies ahead. As our group was called to gear up ready to enter the VR space, it really did feel like we were preparing to go on a journey. With equipment attached to our arms, a weighty backpack strapped to our backs and a headset that covered our heads as well as our eyes I felt like I was ready for a space mission! This experience really did feel like we were getting ready to go somewhere else. A clip was attached to my ear to measure my heart rate and I was informed that the headset was able to measure my breathing. I was curious to see what, (if any) affect these measurements / bodily processes would have on the VR experience… I was immediately made aware, as soon as the experience began, of how the VR was dependant / responsive to my body. As I took a deep breath in and then breathed out my breath became visible! A string of blue pixels flowed out of my mouth at the same speed of my breath. Changing my breath’s speed and density the pixels were aligned with my breath, visually matching my action. Strands of pixels hung in the air around me, like strands of DNA. It became clear to me that the boundary of me does not end with my skin and my body. As my breath seeps out across the space it creeps along the surface of others; just as their breath did traverse across the surface of my body. I looked down to my hands and I could see a stream of pulsating red dots. I felt like I was looking at my red blood cells as they rhythmically pulsed through my body, delivering the oxygen that I was breathing from the space around me. Looking out across the space there were clusters of red pixels moving, these were the bodies of others. The giant Sequoia tree then became visible and I was able to walk through it’s bark to it’s core. As I looked down into it’s roots a vortex of strands, which felt like strands of energy began to swirl. The ground fell away and I was suspended above the vortex – I felt free as I separated from the ground. Ribbons of energy flowed through the roots and the tree and the bodies of others and their breath and me, like an endless DNA strand; it was beautiful. The strands grew higher as they passed through me and over me. I realised that I could alter the path of the strands by moving my arms through them. It felt playful to shape these strands, drawing them in around me. I pulled the strands around my body, creating a cocoon. Everything felt so interconnected as my body was engulfed in the tree, the strands of energy and the streams of breath. This interconnectedness felt very emotional, and whilst it may seem cliché, I felt like I had an epiphany… I came to the realisation of how along with interconnectedness comes dependance. Just as the 39 trillion bacteria that occupy the internal landscapes of my body, so do we exist on the Earth amongst the systems of life throughout nature. We are, in fact, all one – a system of beings all interconnected. Just as the organs inside my body are all interconnected and dependant on each other, so are we in amongst the trees and the roots. I then felt the hairs of my neck stand on end as a breeze passed over my skin. It felt as though my body fell away as I rose higher and higher through the canopy. I was not prepared for how emotional this experience would be. I had hoped it would be fun and I had joked with my son about how jealous he was that he had to go to school whilst I would be ‘playing’ with VR, but whilst this experience did have it’s playful side, it felt like something much more than that. I suppose it opened my eyes, provoked an awareness in me of how detached we have become from the world we occupy. We are blinkered in our day to day lives, not seeing the affect we have on the world around us. We see ourselves as separate beings when we are in fact all connected. And this connection extends beyond a human connection, we are connected to all of nature, to all that lives and exists on this planet. I am shocked that this awareness of the physical has come to me through VR. I had anticipated that I would feel a sense of otherness – a separation from body, an intellectual / visual experience; but I was wrong in my preconceptions. In fact, I actually felt grounded in my feet as I walked through the space. I felt aware of my breath and the pulse of my body; it was like a mediation where only the immediate existed. I suppose the more I explore technology, the more I see that my preconceived thoughts in opposition to it’s ability to connect with body and embodied experience were wrong! Which is great, because I have this other perspective on the body to now engage with, another means of communication, another voice in the conversation.